Nigeria was recently rated the poorest country in the world, ahead of India, and that’s despite several hundred billion dollars in oil earnings over the last decade, a transparency group has said. The Nigerian Extractive Industries Transparency Initiative, as quoted by local media, said Nigeria had earned some US$484 billion from oil in the last 10 years, but the state of its population and infrastructure has only deteriorated. According to the organization, the oil earnings were sufficient to meet the need for an annual US$15-billion investment in infrastructure for the next 33 years, but the funds were not used to do that. Meanwhile, in its latest report on poverty, the Brookings Institution estimated that the number of people living in extreme poverty in Nigeria had grown to 87 million people, versus 73 million in India. According to Brookings, poverty in India is falling while in Nigeria, it’s growing at a rate of six people per minute. What’s more, India’s total population is above 1 billion while Nigeria’s is 198 million, meaning those living in extreme poverty are a much higher portion of the population in the oil-rich state. Lower GDP is one of the factors accounting for the growing poverty despite substantial oil revenues. Nigeria was hard hit by the 2014 oil price collapse and its economic growth slowed from 6.3 percent in that year to 1.9 percent for the first quarter of 2018, Vanguard reports. What’s more, the daily notes, what money has been borrowed to spend on infrastructure in a bid to restart the economy after the price collapse has been very far from sufficient to achieve this goal. Nigeria is also plagued by very high crime rates that are certainly not helping matters, and neither is the displacement of people from the countryside to the cities. 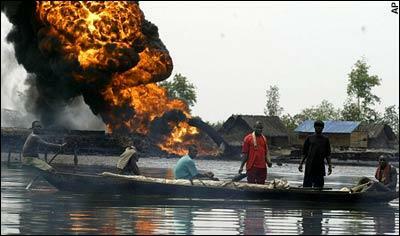 In the oil heartland of the country—the Niger Delta, which is also home to some of Nigeria’s poorest communities, militant attacks on pipelines, and oil theft—had also played a role in aggravating an already bad situation.